Rajas Poblanas with cream are most often served as a side dish with your meal. In this recipe some cheese is added at the end. The dish makes a great appetizer for company. 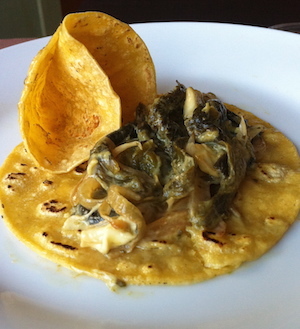 With rajas Poblanas you mix the earthy flavor of Poblano chiles with smooth Crema Mexicana. The word “rajas” means strips or bands of something. Mexican cuisine has been roasting rajas for millenia. 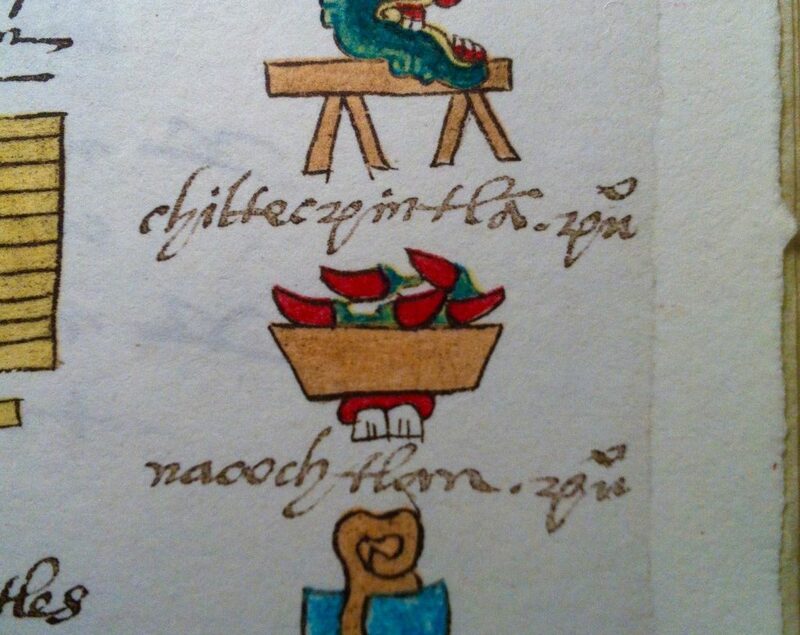 This picture of chiles served on a platter is painted by a Mexica artist in 1541. It’s in the “Codex Mendoza,” a pictorial, annotated chronology of Mexica (Aztec) history ordered to be written by Antonio de Mendoza who was viceroy of the conquered lands, called “New Spain” at the time. I photographed the picture when I visited the current owner of the codex, the Bodleian Library in Oxford. You can make original rajas simply by roasting chiles and cutting them into strips. I grew up eating them that way. They are delicious, as shown in this recipe that uses Anaheim chiles, without cream or cheese. Chiles were roasted and served in many forms, but always “sin queso,” without cheese. It was only after the arrival of cows and goats that lactose entered the Mexican diet. Imported milk falling in love with the local chiles was inevitable. The marriage of cheese with chiles is simply delicioso. I always suggest that rajas be served alongside the well-known chile con queso (recipe here) because contrasting the two is not only tasty, it is also intellectually delicious. There’s a history link. Chile con queso evolves culinarily from rajas. Cows arrived in Mexico in 1527, and it was only matter of time until cooks saw the beauty in combining the chile poblano with cream. In our Texas Mexican region we added cheese, and now chile con queso is traditional in the entire Texas Mexican Region, from Houston to Monterrey. The difference between the two dishes is that “queso” adds tomatoes and emphasizes the cheese more than the cream. Texas Monthly gets it wrong to trace the origin of queso to the “queso flameado,” which is purely cheese with chorizo, no chile. If you take my suggestion to serve both Rajas Poblanas and Chile con Queso side by side, you’ll savor the nice, interesting differences. These are cousins! 1. Place the chiles under a broiler until the skin is completely blistered and somewhat charred. Place in a paper or plastic bag for about 10 minutes so that the steam loosens the skin, and then remove the skin, seeds and veins. Slice the chiles into 1/2″ wide strips. 2. Peel and slice the onion into 1/4″ wide strips. 4. Heat the oil in a skillet over medium heat, add the onions and sauté until they soften. 5. Keeping the heat on medium or low, add the chiles and the Crema Mexicana and heat them thoroughly. 6. Add the Panela cubes and stir gently. Serve the Rajas with hot corn tortillas, of course. Warning: You may uncontrollably crave a margarita! –“I can’t wait to try this! I’m so tired of the canned peppers and Velveeta “queso” and I’m always invited to two Tex-Mex dinner parties. Next time I’m taking this – the REAL THING! I really enjoy all the history you provide, too. Knowing the origin makes things taste better to me. It’s like having one of my grandmother’s favorite recipes easily accessible with all the history attached.